The bus compressor installed in ABBA's Harrison console is now available 'to go'. Plenty of VCA compressors have hit the shelves in recent years, but almost all mimic or at least draw substantial inspiration from SSL's famous G-series bus compressor. 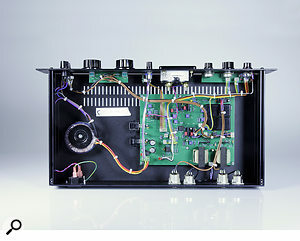 Before SSL's creation, though, came the Dbx 160 — the first, all-discrete version of which is often known as the '160VU', in recognition of the large bouncy-needle VU meter that dominates its front panel. It's probably less well known that the 160 also provided the basis for some of the compressors that were installed in large-format consoles, and the Polar Studio 160 compressor, reviewed here, has its origins in just such a processor. Back in the '70s, ABBA set up Polar Studios in Sweden's Stockholm and its large-format Harrison console was used to record several of their hits. Built into these consoles were bus compressors that were made by a few manufacturers, including Valley People and, yes, you've guessed it, Dbx. The one in the ABBA console was a stereo Dbx model, derived from their 160, complete with custom discrete VCAs. Polar Studio was relocated in 2004, but the console remains in service at the new venue, as does Lennart Östlund, Polar's chief engineer since 1978. Östlund decided that it would be nice to create a 2U rackmount version of the console's compressor. It has to be said that the resulting Polar 160 does not come cheap — indeed, the launch price puts it in direct competition with a number of highly revered big-name bus compressors. I found the Polar 160's user interface gratifying. The solid, no-nonsense black front panel is adorned with large, vintage-looking knobs, as well as an attractive gain-reduction meter, which can be set, courtesy of an adjacent rotary switch, to display the amount of gain reduction being applied, or the input or output level. The other bit of metering is the threshold indicator — a pair of LEDs that blink red to tell you when the signal has exceeded the user-definable threshold, just as on the Dbx 160. If you've ever used the Dbx 160 (or perhaps a software reincarnation, such as the plug-in for the UAD platform), you'll know that these LEDs are often a more useful guide than the VU meter, and it's the same here: more often than not I found that if those LEDs were blinking on and off in time with the music, the Polar 160 was doing something that sounded 'right'. Yet, the Polar 160 departs from the Dbx model in that it provides a ratio control. The Dbx 160 is often described as offering 'over easy' compression, which I've always thought of as a soft-knee in combination with a ratio that increases in relation to the amount by which a signal exceeds the threshold. Coupled with a relatively slow attack, but then a fast-acting gain reduction, this gives the Dbx 160 its characteristic action — a sort of forgiving 'grabbiness' which seems to polarise (forgive the pun) opinion; some love it, others hate it. The 160 takes the same approach to the time-constants, so that grabbiness, bounciness or whatever you want to call it, is still there if you want it. But the ratio control, whose markings run from 1:1 (no compression) to infinity (heavy limiting), make it possible to configure this device to inflict much less obvious damage — or rather more obvious if you wish! Many people like to use the Dbx 160 as a parallel compressor, blending the processed and unprocessed sounds together at a mix determined by the user. To do that with a Dbx 160 you need a console (or dedicated blend box at least), but the Polar 160 caters for this inside the box, offering separate level controls for the processed ('Compressed Level') and unprocessed ('Clean Level') signals. I found this really useful; for some reason, crushing things quite aggressively with this compressor and juggling the balance of processed and unprocessed signals works really well. My only criticism is that the dry and processed paths each have their own level control. Personally, I think I'd prefer to have seen a single 'blend' knob, which enabled me to mix to taste without having level changes skew my decision making. That said, there are only two controls to balance, so parallel operation will not be beyond the wit of anyone, and the separate controls can be more useful in some circumstances. For example, riding up the processed level in a chorus or outro, for that bit more power and solidity on a drum bus, is easier with the Polar 160's dual-control configuration. During the couple of months that I used this compressor, I deployed it on a range of sources, including stereo and mono tracks, single sources in the mix, and both drum and stereo mix buses. I didn't have a Dbx 160 to hand, but I did have the UAD plug-in (which I've compared directly with a 160 in the past) just as a broad point of comparison. The first thing to say is that although this Polar Studio version is very obviously related to the Dbx 160, and the gain-reduction action itself can be very similar, the overall sound and feel is much nicer — somehow more 'forgiving' and smoother, and a little warmer in character. That's due, partly, to the blend facility, partly to the user-configurable ratio, and partly just the sound of the thing — presumably due to the VCAs and the output transformers. Used as a channel compressor for acoustic guitar, I found that the 160 worked well on picked material, with a ratio of about 4:1, and the threshold set so that those red lights blinked in sympathy with the playing. Better sounds were achievable in parallel mode, though: I found that about 5-7dB of gain reduction (GR) showing on the VU meter worked well on the test material. It's worth noting that the meter's needle seems quite relaxed, and I suspect that it's concealing some of what's going on beyond the action on the 'peakiest' bits of a sound. On piano, I was able to achieve a pleasant softening of the sound, as well as controlling the part's dynamics, but without losing the all-important liveliness of the performance. Again, the Polar 160 worked well enough either in series with very gentle ratios (about 1.5:1 and just tickling the GR meter, or up to 3 or 4:1 with the threshold lights just jumping to create a slight 'bounce') or in parallel with slightly more assertive settings (a ratio of around 6-10:1, with about 5dB GR, with a compressed/clean blend a little more in favour of the dry this time). This isn't something I'd want to use for more 'natural' styles (classical piano), as there's definitely a process going on, which gently rounds and warms the sound. The low end in particular is treated in a nice, subtly coloured, way. Of course, that makes it perfect for creative use in almost any genre other than classical, but particularly for rock/pop material. Moving on to more traditional Dbx 160 territory, I ran some stereo acoustic drums through the Polar 160, comprising a few close mics balanced against room and overheads. On a relatively sparse loop containing kick, snare and hat with an occasional crash cymbal, this processor worked beautifully to fatten things up. It added what can best be described using that over-used term 'analogue warmth'. The discrete VCAs are at the top-right of the PCB, not that these anonymous boxes give much away about what's going on inside!The action itself is well suited to drums, more generally, with something of that characteristic 'grabbiness', which seems to result from an attack that lets the initial transients through before clamping down fast. Kicks were kept firmly in their place without making them feel unnatural, for example. On snare, it added a really interesting, slightly grainy — not at all unpleasant — sustain, while still emphasising the 'thwack', 'knock' or whatever you want to call it. I found that a compressed/clean blend was almost always required for judicious compression of the drum bus, but also for kick and snare on their own. I could see the Polar 160 doing sterling service for drums in a range of genres. Interestingly, I was able to mimic the gain-reduction effect pretty well in the box, by using UA's Dbx 160 plug-in in parallel. That's quite a compliment to UA, I suppose, but I have to say that the software doesn't come close to imparting the beautiful sonic character that the Polar 160 does (not that it was intended to model this compressor, of course), and the lack of ratio control makes it far less versatile. Given the cost of this Polar product, I can only hope UA or another developer take this challenge on some time soon! Used on electric bass, I have to say that the Polar 160 was not my first choice for all styles. When it's being particularly assertive — which I find is required with bass more often than most sources — that Dbx-ish character can be a little too obvious for my tastes, and there are so many less intrusive options. That said, that grabby action worked really well in injecting a little 'bounce' into bass parts, making it ideal for bass in a lot of pop material. I did find that I was crying out for some way to shape the side-chain — a high-pass filter, perhaps, a side-chain insert point, or a simple external side-chain input — which would enable me to fine-tune this compressor's response. GR aside, though, the overall sonic character on bass was very pleasant. And so to this processor's raison d'etre, the stereo mix bus. I suppose I shouldn't be surprised that I enjoyed using the Polar 160 on the stereo bus, given the heritage of this piece, but I'd fully expected to dislike it, simply because I've never really liked the Dbx 160 sound for this sort of job. I suppose the combination of parallel processing, user-determined ratio and the more elegant, effortless coloration imparted by the Polar version just make it work. I found that I needed only to tickle the gain reduction needle in this role, even when blending dry and processed signals. Again, side-chain control would have been nice, but there's a reason that this circuitry has stood the test of time in Polar's Harrison console. I never thought I'd find myself wanting to use a Dbx 160 on the stereo bus, yet I can imagine wanting to use this in that role frequently. Probably my favourite application for it, though, is on the drum bus, particularly for pop/rock material, or other modern styles, such as hip-hop, where that easy-going rhythmic snap can prove particularly effective. In fact, the lack of any means of sculpting the side-chain signal is my only real operational criticism. Adding such a facility would increase the versatility of this processor significantly. Perhaps the most controversial thing about the Polar 160, then, is its price. I've no doubt that the price is down to the scale of production, the quality of components and so on — and perhaps the ABBA connection makes a small contribution. The price being what it is, one has to weight the Polar 160 up against other bus compressors in the same price bracket — which means the likes of the API 2500, Dangerous Music's Compressor and even tube devices such as the Chiswick Reach Stereo Valve Compressor. While there may be more versatile options, though, the Polar 160 has every right to hold its head up in this company. The Dbx 160 is often described as a one-trick pony. Polar Studio's interpretation shares the same essential characteristics, but it has more tricks up its sleeve, sounds more effortless and graceful, and is thus more thoroughbred stallion than pony. It's perhaps something of a left-field choice for your only bus compressor, but I'd defy anyone not to fall in love with it. Well worth checking out. Dbx offer several products whose origins lie in the 160 — but they're rather different from what's on offer here. Original Dbx 160s and 161s crop up frequently on the second-hand market, though prices seem to have risen over the last year or so. Really, when considering alternatives to the Polar 160, one must look to other dedicated bus compressors from the likes of API, Neve and SSL — all of which sound very different from this one. Classic Dbx 160 'grabby' action. Much more versatile than the Dbx that inspired it. Dedicated ratio and wet/dry level controls. This is a delightful rackmount implementation of the bus compressor in ABBA's Harrison console, whose sound has graced countless records by major artists. Based loosely on the Dbx 160 'VU', it's far more versatile and sounds much smoother and more 'rounded' — and is thus much better suited to bus-compression duties.